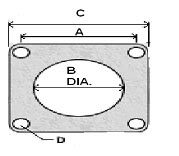 All Seals Connector Gaskets are available die-cut from the listed standard materials. These materials cover all types of applications and configurations. 0.020” (0.51) thick silicone or neoprene filled 24 x 24 aluminum screen. Used in applications with joint unevenness up to 0.002” (0.05). Also available in 0.016” thickness. 0.032” (1.57) thick solid silicone with monel wire oriented perpendicular to the gasket surface. Used in applications with joint unevenness up to 0.008” (0.20) which require an environmental or pressure seal. Also available with a pressure sensitive adhesive (PSA) backing.